Go to https://www.prolineracing.com/biggive/ and Enter to Win and Donate each day! During the holidays we are always reminded of how much fun it is to give gifts, gifts of time, gifts of products, gifts of service and gifts of donation. 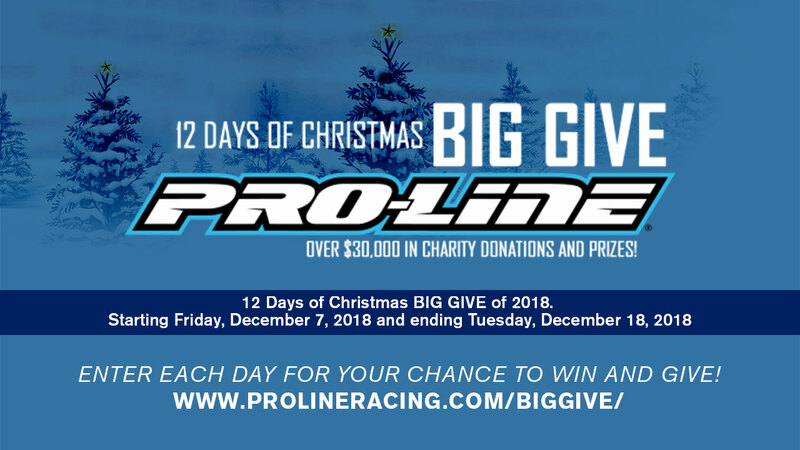 This year Pro-Line would like to give 12 lucky winners an awesome gift with the 12 Days of Christmas BIG GIVE of 2018. Starting Friday, December 7, 2018 and ending Tuesday, December 18, 2018 Pro-Line will be giving away a prize pack each day for 12 days! Pro-Line Tire & Wheels: Most packages include a full set of pre-mounted tires. ** All kits come with a clear body unless otherwise noted. Painted body will replace the clear body. * Pre-Built Roller DOES NOT INCLUDE electronics, motor or radio unless otherwise noted. Visit the PRO-MT 4×4 page to see what equipment is needed to complete. ** T-shirt and hat may vary in style and size and cannot be exchanged. $50 to $100 Pro-Line Gift Certificate for use on your favorite performance accessories at prolineracing.com. $1,000 to $5,000 Charity Donation in your name to one of the charities below of your choice. Simply enter your email address and submit. No purchase necessary to participate. One entry per household, per giveaway, per day. Participants MUST BE 18 YEARS OR OLDER to enter and/or win. All entries are put into a lottery system that randomly selects a winner. Winners will be notified by email after sweepstakes deadline. Weekend winners will be notified the following Monday. Gift certificate value does not cover any applicable shipping cost or charges. Terms and Conditions. Each Sweepstake is a 24hr period defined by the countdown timer clock. Every day is a new Sweepstakes for another prize pack, so be sure to enter each day for a chance to win.